Building Fine Roofs over New Hampshire Homes Since 1981. 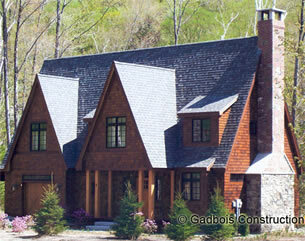 Gadbois Construction has been building high quality, professional roofs in New England for over 25 years! Gadbois Construction is a specialized roofing company and roofing contractor based in the Lakes Region and White Mountain Region of New Hampshire. We provide a variety of New Hampshire roofing and exterior construction services with unique programs and solutions to meet your construction objectives and project budgeting goals. It could not be easier to accomplish your roofing and exterior construction objectives! Gadbois Construction, a New Hampshire Roofing contractor, is proud to service the Lakes Region of New Hampshire as well as the NH White Mountains. When selecting a NH Roofer, it is important to remember that experience and craftsmanship are important factos when choosing the right roofing company in New Hampshire. © 2009 Gadbois Construction. All Rights Reserved. Website designed and maintained by SEO WebWorks.